Happy Thanksgiving! It’s hard to believe we’re approaching another Holiday season because this year has really gone by fast. Between travelling, attending numerous weddings, and buying our first home, I watched spring turn into summer so quickly and before I knew it, I was drinking pumpkin beer and decorating for fall. Sometimes (okay, more like a lot of times) I get caught up in the busyness of work and what’s next on my to-do list, that I forget to take a breath and be more present. I need to remind myself it’s important to step back, regain my footing, and find some perspective, especially during those busy weeks when time seems to fly. Instead of getting stressed out about Thanksgiving meal preparation or my upcoming deadlines at work, I’ve made a decided effort this week to force myself to slow down, reflect on what I’m thankful for, and remind myself to be appreciative for the great things in my life. While doing this, I decided to put into words and share some of the things I’m most thankful for. Evan and I bought a house several months ago in Ballard, a neighborhood North of downtown Seattle. We expected the process to be long and grueling in the crazy housing market of Seattle, with bidding wars, high hopes, and some disappointment. However, we worked with great realtors and honestly, got really lucky; we looked at a handful of houses before making an offer on our place. To our surprise, we had no competing offers, so our process was pretty pain-free (once I got past the down payment part). We moved in this past August and have been gradually getting situated. We even purchased new patio furniture and enjoyed a few nice nights on our rooftop deck before the summer weather departed. We love having our own space in a much quieter neighborhood, and our dog, Toaster, loves sitting by the windows in our living room, watching for people, dogs, and whatever else she feels like she needs to protect us from. I’m so thankful for the opportunity we’ve had to buy a home together and I’m thankful we have a place to call our own. I look forward to the many memories I know we will make here. This Thanksgiving will be the second Thanksgiving we’ve spent in Seattle away from our families, and the first one we’ll spend together in our new home. Although it’s always hard to be away from family on Holidays, they’re still on my mind, especially when certain traditions make their way into our celebration or onto my dinner table. My parents just sent me a Thanksgiving care package: a box full of vegetables from their garden. It was such a nice surprise and I can’t wait to cook up freshly grown carrots from them on Thursday. My family has always been so loving, caring, and supportive throughout my life. They have taught me so much and shaped me into the person I am today. For that I am incredibly grateful. Not only are we spending Thanksgiving away from our families this year, but this is the first year in six years that we aren’t celebrating Friendsgiving with our good friends Kellie and Dan. What started as an impromptu dinner party with a full turkey dinner spread, turned into years of wonderful Friendsgivings. One year we invited Evan’s colleagues visiting from China to join us, and last year, Kellie and Dan flew out to spend the long weekend with us in Seattle. When I think about these memories, I’m reminded of how thankful I am for great friends. Friends that fly out to visit us on a whim. Friends that I grew up with, making forts and selling lemonade with, friends that I may only see a few times a year, but can pick up exactly where we left off. Friends I met during college, that share my love for Christmas or know exactly how to cheer me up on a bad day. Friends that call me just to chat or friends I know are up for any kind of new adventure. I’m thankful for all of the great memories these friendships have given me and the unquantifiable impact they’ve had on my life. Finally, I find myself reflecting on how much has changed in my life over the past two years. When Evan got his job offer in Seattle, I’m not going to lie, I was a bit anxious about moving away from home. We took a big leap together, moving to a new city, making new friends, starting new jobs. It was intimidating at times, but I just kept reminding myself we were in this together and things would be okay; it was comforting and helped me adjust to a new environment. I’m so thankful to have a husband who supports me when I need someone to lean on and who is adventurous and pushes me to experience new things I likely wouldn’t do on my own. Evan, thank you for challenging me to be a better person, and for being a goofball and making me laugh everyday. I’m thankful to have you by my side and I’m grateful for your friendship and your love. Now, let’s move onto pie. When I mentioned family traditions that make an appearance at my Thanksgiving dinner table, this apple pie recipe is one of them. It comes from my mom, who in my opinion, makes the best apple pies. This is the only recipe I use, and as long as you don’t mind peeling a few apples, it’s well worth the effort. 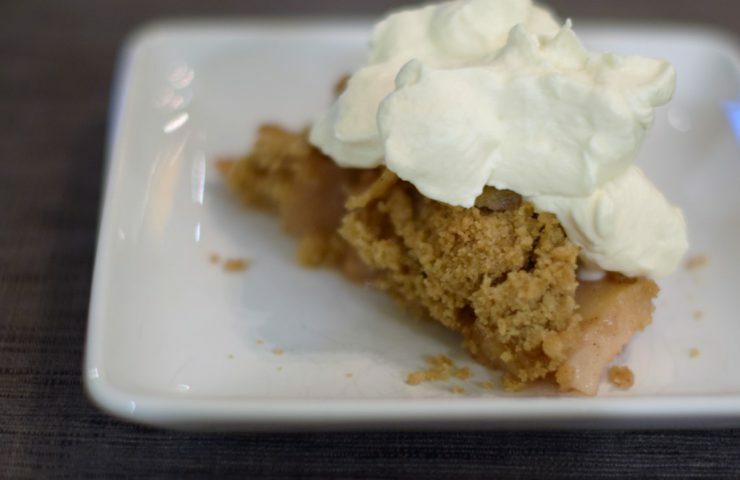 This pie has a crumb topping, but you could easily swap out the topping for another layer of crust. To begin, preheat the oven to 350°F. 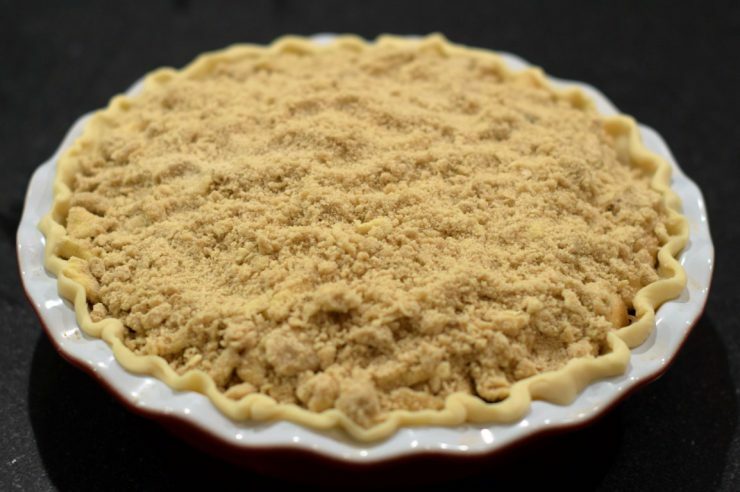 In the past, I’ve made my own pie crust, but I wanted to save some time so I purchased a pre-made crust. Let the crust sit on the counter at room temperature while preparing the apples. Wash, peel, core, and slice 10 apples. I’m not super picky about which type of apples to use for pie, so I tend to use whatever I have on hand. However, feel free to use whatever type of apple you like. 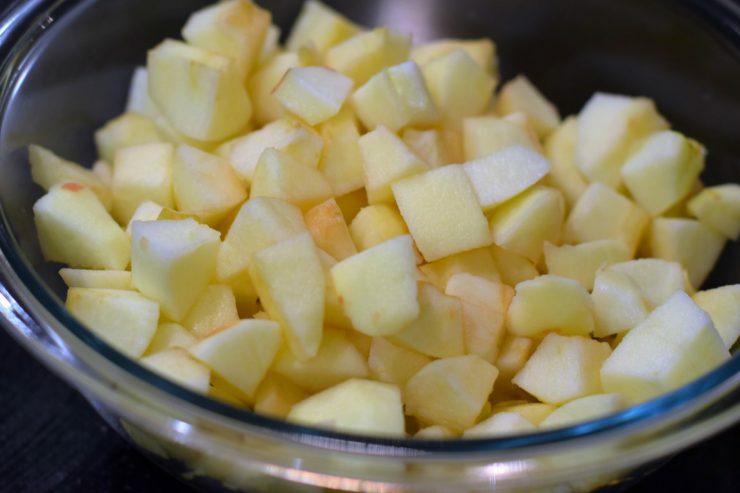 Cut up each apple slice into bite-sized pieces and add to a large bowl. 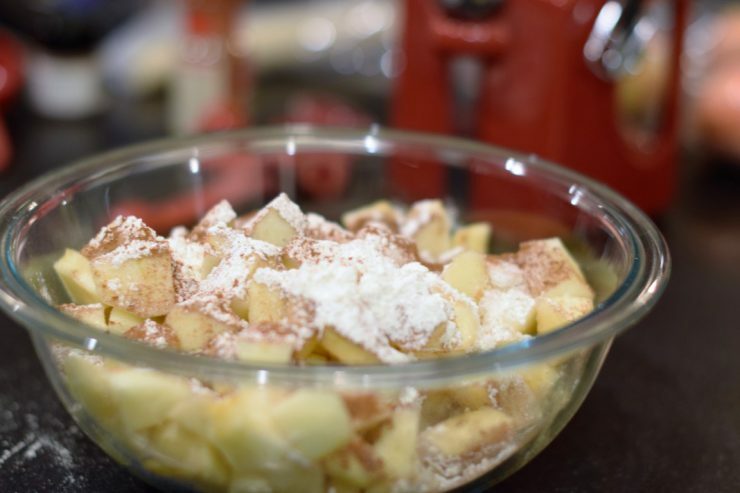 Add 2/3 cup sugar, 1/2 teaspoon cinnamon, 1/4 teaspoon nutmeg, and 2 tablespoons flour to the diced apples. Mix well to ensure all the apples are evenly coated. Set the apples aside while you prepare the crust. 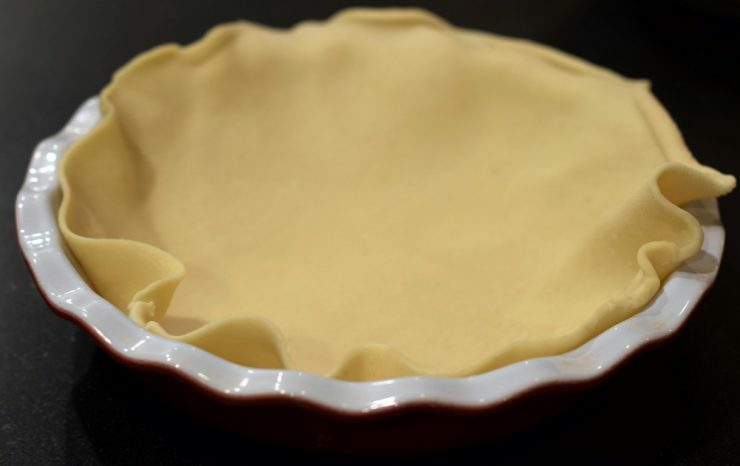 Carefully unroll the pie crust and lay on top of a deep pie dish. I recommend using a deep dish because 10 diced apples makes a lot of filling. Use your hands to press the crust firmly into the pie dish. I like to make a pattern along the edges, but it’s totally not necessary. Once the crust is ready, pour the apples into the dish and spread out evenly. Set aside while you prepare the crumb topping. In a small bowl, mix 1 cup flour and 1/2 cup brown sugar. Cut in 1/2 cup of cold butter into the flour and sugar. 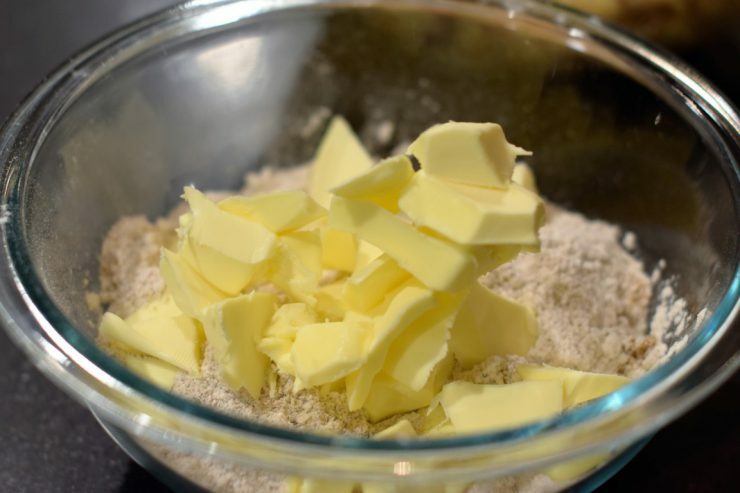 Using your hands, roughly mix the cold butter into the sugar and flour until it resembles a crumb mixture. Be careful not to over-mix. Add the crumb mixture on top of the apples, providing a nice even layer of topping. Place the pie dish on a cookie sheet to prevent caramelized sugar from spilling onto the bottom of your oven. I should have taken my own advice last time I made this pie! Transfer the pie to the oven and bake for 1 hour, until the apples are soft and the topping is golden brown. 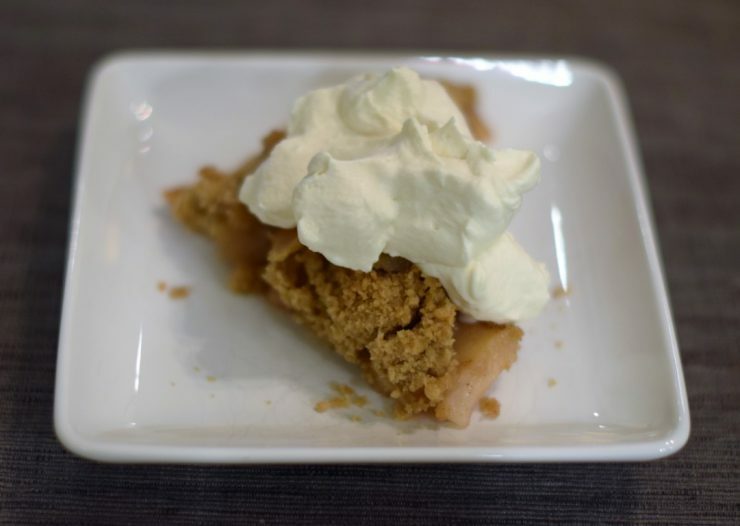 Let cool about 10-15 minutes before cutting into the pie and serving with some homemade whipped cream or ice cream! Store in the refrigerator, covered, up to 1 week. 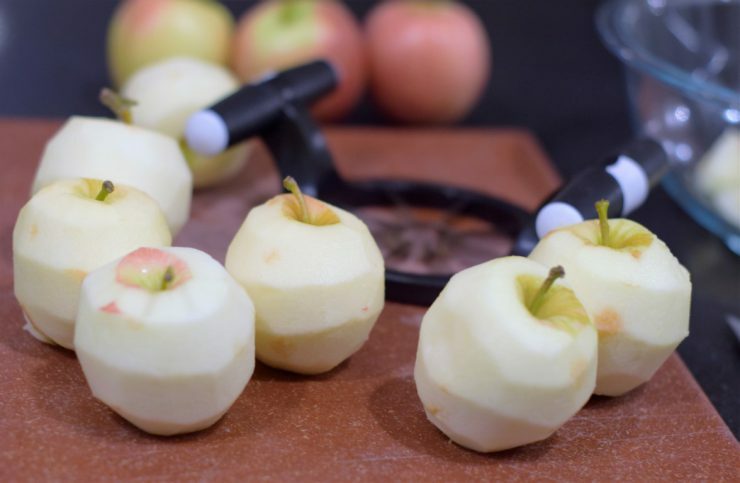 Wash, peel, core, and chop apples into bite-sized pieces. 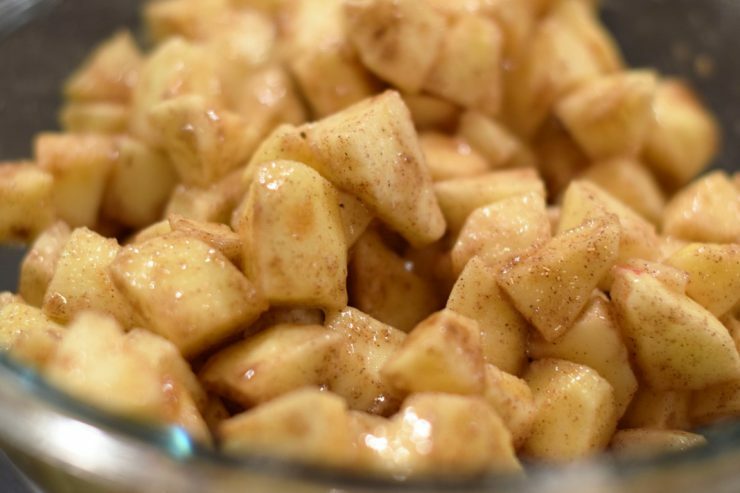 In a large bowl, toss apples with sugar, cinnamon, nutmeg, and flour. Mix well to ensure apples are coated. Set aside. 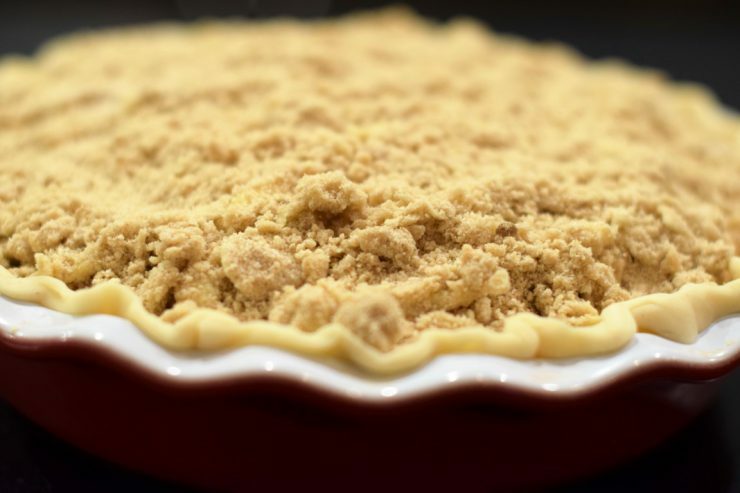 Unroll the pie crust and lay on top of a deep pie dish. 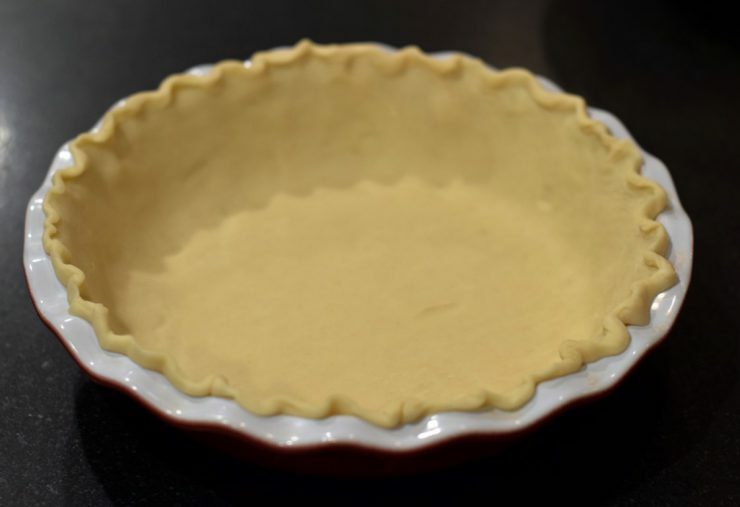 Use your hands to press the pie crust into the dish. When the crust is ready, pour the coated apples into the pie dish. Set aside. To make the crumb topping, mix flour and brown sugar. Cut in cold butter and mix with your hands until it starts to resemble a crumb mixture. Add the crumb mixture on top of the apples, spreading out to ensure an even layer of topping. 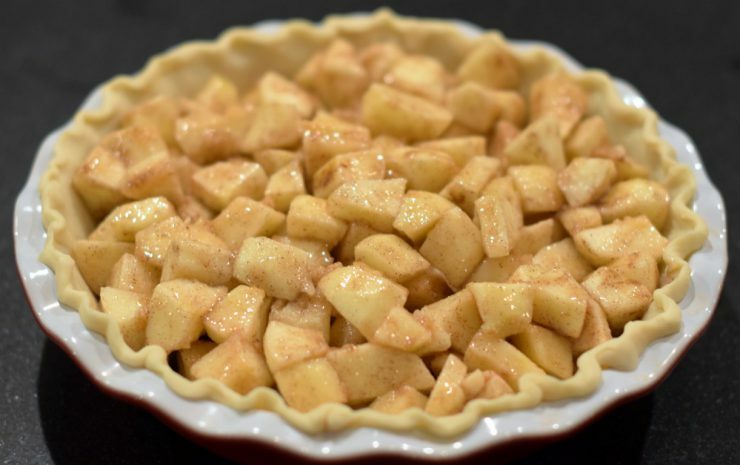 Place pie dish on a cookie sheet (to avoid spills in the oven) and bake for 1 hour until the apples are soft and the topping is golden brown. Let cool for 10-15 minutes before serving with homemade whipped cream or ice cream!